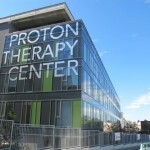 Check out the latest news about proton therapy: this week, find out how this state-of-the-art treatment modality is helping young patients lead a normal life during treatment and forget about cancer for just a minute. 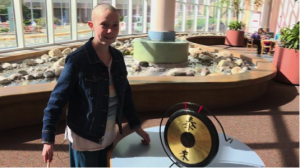 Izabella Voelker, a 12-year-old battling a rare brain tumor, has celebrated a milestone in a very big way last week as she striked a gong as a symbol of the end of her proton therapy treatment. Izabella, who is known as Bella, says her journey began with a pain in her elbow. Last May, she was diagnosed with a very rare brain tumor, and the outlook seemed so hopeless that Bella went so far as to write her own will. On the advice of her doctors at Children’s Hospital & Medical Center in Omaha, her family decided to send her to Scripps Proton Therapy Center in San Diego. 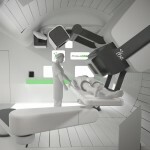 Proton therapy precisely targets tumors instead of exposing the rest of her body to radiation. 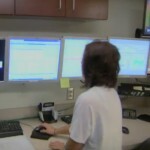 “With regular treatment, they would have had to radiate my spine,” Bella said. “The radiation would have hit my organs as well.” She went through week after week of intense radiation sessions. After having her implanted treatment devices removed at Children’s Hospital and Medical Center, Bella was asked how she would celebrate the huge milestone and she suggested striking a gong. That’s just what she did Thursday. Other patients will have the same chance when they get a port removed. “They have something that they can use to celebrate and to further express their feelings and just to be done with all this,” she said. Bella is currently in remission and off treatment. 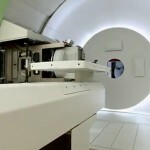 There was no tumor to be seen in her last MRI. Earlier this month, 100 pediatric patients, whose days are usually filled with treatments, checkups and doctors, were given the unique opportunity to go to Disney World thanks to the Sunshine Foundation in New Jersey as part of their “Operation Dreamlift”. Kelly is a sixth grader from Wilmington who has undergone two surgeries to remove a highly aggressive and malignant tumor from her brain, called medulloblastoma, that doctors found last October. She’s had radiation treatments and chemotherapy. She’s also received proton beam therapy at MGH, which targets tumors with minimal damage to surrounding healthy tissue. Dimas, a second grader from West Virginia, has a malignant brain tumor and also came to Boston for MGH’s proton beam therapy. His mom said her son was excited for the aquarium visit: “It’s a bright spot to look forward to in the midst of going to proton therapy and other appointments and taking medicine”. Kelly and Dimas wore big smiles as they watched fur seals and sea lions spin and swim around for herring and squid. Kelly’s mom said: “I just loved to see her doing things that typical kids do, where so much of her time is spent either in treatment or not feeling well.”. The kids got to go on a behind-the-scenes tour of the “fish hospital.” At the tide pool, Dimas fed crab meat to a flounder. Kelly picked up a big horseshoe crab, undaunted by its hard shell, claws and long tail. For a couple of hours, there were no hospitals beds, no grueling treatments, no poking and prodding from doctors and nurses.